Reasoning is the ability to infer propositions from given propositions. The psychological research is concerned with the cognitive processes underlying human reasoning. An influential way of addressing this question has been to compare observed reasoning performance with normative systems such as bivalent logic or probability theory with the goal to infer that underlying processes somehow mimic or reproduce normative systems. 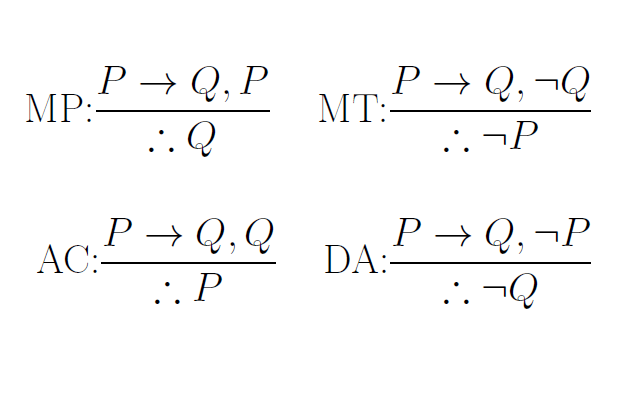 The four conditional inferences for a conditional “If P then Q”: Modus Ponens (MP), Modus Tollens (MT), affirmation of the consequent (AC), and denial of the antecedent (DA). General theories of human reasoning can be categorized into three broad classes: form-based theories, content-based theories, and hybrid theories. The basic idea underlying the form-based theories is that reasoners transform propositions into abstract representations and perform the reasoning processes on the abstract representations. The most prominent examples of form-based theories are the somewhat dated mental-rule based theories and the popular mental model theory (e.g., ; ). To deal with ubiquitous content effects (i.e., the empirical observation that responses in reasoning task are strongly influenced by the content of inferences) the mental model theory assumes that the content of inferences influences the construction of the initial mental models. In contrast, content-based theories assume that reasoning is primarily based on reasoners representations of their knowledge related to the content of the inferences. For example, within the Bayesian rationality framework it is assumed that reasoning is basically the estimation of the conditional probability of the conclusion given the premises where the probability of the premises is estimated from reasoners’ background knowledge. Hybrid theories of reasoning try to somewhat overcome the duality between form- and content-based theories. The dual-process framework assumes two distinct types of cognitive processes, autonomous Type I processes that do not require working memory resources and deliberative Type II processes that require working memory and are able to perform mental simulations. Typically Type I processes are fast and strongly coupled to prior experiences are associated with many of the observed biases. In contrast, Type II processes are usually slow, rule-based, controlled, correlated with general cognitive ability, and more often produce normative responses. Orthogonal to the dual-processes theories is the dual-source idea (; ) which assumes that reasoners possess both form-competence and content-competence which are integrated when asked to produce a reasoning outcome. In my research I have been mostly concerned with conditional reasoning. Conditional reasoning is mainly concerned with four inferences from conditional statements of the form “If P then Q” which are displayed in the Figure. In addition to the conditional statement the inferences contain an additional (minor or categorical) premise consisting of a single proposition (P, not P, Q, or not Q) and a putative conclusion also consisting of a single proposition. In my first paper we could show that the form-based theories or the content-based theories alone are not able to explain the complete pattern of data obtained in conditional reasoning when comparing deductive instructions (typically used by form-based theories; see also ) and probabilistic instructions (typically used by content-based theories) as they are based on a single-process only. In contrast we argue that hybrid theories which at least two different processes are necessary. Since then I have been concerned with more theory comparison for conditional reasoning and am currently working on the dual-source model. For a complete overview of my research on reasoning see here.